Some of the unique projects in this book include two recipes for scented bookmarks. You may also want to grow your own herb garden as some of the recipes call for lemon verbena and tarragon. I tried making the face elixir which calls for Aura Cacia Chamomile and Aura Cacia Ylang Ylang. It was intoxicating and induced a deep relaxation. You can use it at night. All you really need to find is Aubrey Organics - Rosa Mosqueta Rose Hip Seed Oil, .36 fl oz liquid - which is what I used, chamomile and ylang ylang. There was really no need to order apricot oil and Mayumi Squalene - Squalene Oil which is quite expensive. A few of the recipes require you to first prepare a stock. Instead I'd recommend just using 1 teaspoon of stock base for every cup water. You can then substitute this for the homemade stock called for in the recipe. In one of the recipes you use cumin seeds and cumin oil. For the home cook it would just be easier to find the cumin seeds. This book introduced me to quite a few essential oils I've never heard of and I've read quite a few books on essential oils. "Litsea Cubeba" was totally new to me and it is used to make a bath oil. 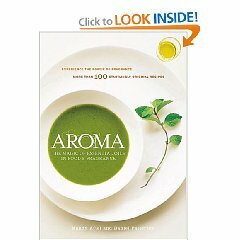 To find some of the oils used in the recipes you may want to try looking around here at amazon. There is a source section at the back of the book but it would have been much more useful if it has listed specific ingredients and then the exact source. As it stands you may need to go to numerous websites to look up ingredients. Some of the things I noticed in the recipes may also discourage the making of some delicious foods. For example, in the Sweet Onion Rosemary Soup you need to make an infused oil as a separate recipe. The recipe uses six cups of olive oil. It would seem easier if the recipe had just required you to make an exact amount. One recipe uses 1-2 quarts of the oil which seems extravagant. In a recipe I really wanted to make - Artichoke-Saffron soup, there are not enough instructions to make me feel confident that I could make it. I couldn't figure out what you are supposed to do with the artichokes after you cook them. Surely you don't put the entire artichoke in the blender as the recipe seems to imply. For some of the recipes you will need to own an ice cream maker. Otherwise all you need is non-reactive cookware. It is not recommended that you use anything like aluminum or cast iron. I would only recommend this book to the very adventurous or to someone who loves entertaining because the recipes are mostly for 8 servings. The recipes will also be fairly expensive to make because you need to buy specific essential oils for almost every recipe. There are some essential oils you may only use once unless you intend to make the recipes again. I was lucky because I have a small collection of essential oils so making the facial products was fairly easy. I will on the other hand probably never buy cumin essential oil because I fear I'd never use it again except in the recipe in this book. This is really a journey of sensory discovery and one of the most unique books I've ever encountered.